Discussion focuses on the unique group of writers who created horror and dark fantasy fiction for Weird Tales, Unknown, Astounding, and other pulp magazines. Included are such leading lights as Robert E. Howard, Manly Wade Wellman, Fritz Leiber, H.P. Lovecraft, Clark Ashton Smith and Frank Belknap Long. Here we can delve into such topics as Lovecraft in the cinema, artists of the weird and macabre, related magazines of the fantastic, contemporary horror writers who have utilized weird themes, and, of course, the original "Old Ones", including Poe, Machen, Blackwood and Dunsany. 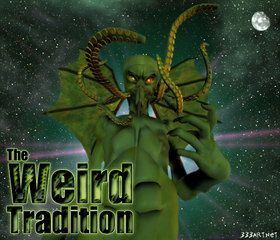 The Weird Tradition also hosts THE DEEP ONES reading group, which discusses a short story beginning on Wednesday each week. You can find the Spring 2019 reading schedule here. A listing of all discussions to date can be found here.